Blanche Angelina Pitts passed away at home on June 16, with her children present, in Santa Barbara, the city she so dearly loved and where she spent the majority of her life. She was born in Los Angeles, CA to Perfecto and Sebastiana Arguedas, both from Jaurrieta, Spain. She was the middle of two sisters, Josephine Wheeler and Carmen Craviotto, and felt so blessed to have come from such an incredible family. The family relocated to Lancaster, CA during the depression where they ranched with Blanche’s Uncles’ and Aunts’ families. As a child, she loved running through the surrounding hillsides covered in poppies and lupins and had many fond memories of those years on the ranch. 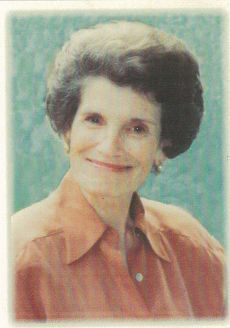 After graduating from Antelope Valley High School, Blanche attended UCLA for two years, and then Wright McMahon Secretarial School in Beverly Hills. She was married for twenty-five years to her high school sweetheart, David Pitts, in 1947 and lived in San Luis Obispo for several years before settling in Santa Barbara around 1949. Blanche was kind and gentle, had a wonderful sense of humor, and was the most amazing Mother. She cherished her family, was a passionate reader, and loved the arts and all of nature. Her home was a reflection of these values. Blanche is survived by two of her three children: Diane (Mike) Geraghty and Stephen Pitts of Santa Barbara; her sister, Carmen Craviotto of Santa Barbara; three grandsons: Evan Pitts, Michael Geraghty, Jr., and Ian Pitts; three great-granddaughters: Shayla Pitts, Lilia Pitts and Rowan Pitts; eight nieces and nephews and friends who loved her. She was preceded in death by her parents, her sister Josephine Wheeler, and her son, Gregory Pitts. A memorial service will be held on Saturday, August 15th, 11:00 a.m. at the First Presbyterian Church Chapel, 21 E. Constance Ave. In lieu of flowers, contributions may be made to the Music Academy of the West or the Santa Barbara Visiting Nurses Association.